Personalising gastro-intestinal cancers radiotherapy: the ultimate aim of the research of my group is to maximise clinical benefit in terms of better tumour control and reduction in toxicity after radiotherapy to enhance life expectancy of the patients. Despite several advances in techniques of radiotherapy planning (intensity modulated radiotherapy), tumour imaging (PET, MRI); radiation delivery (rotational arc therapy) the techniques and doses used for radiotherapy treatments of gastro-intestinal malignant cancers have remained unchanged. Chemoradiation remains the main treatment for inoperable patients and the outcomes for tumours such as oesophagus or pancreas have not improved over the last decades. The causes of local failure are due to several aspects: inadequate radiation dose, low oxygen levels (hypoxia), and failure to target areas that have an unfavourable micro-environment. The advances in technology, imaging and understanding of biological processes offer an opportunity to explore novel approaches. The aim of my research has three main themes with the ultimate aim of maximising clinical benefit in terms of better tumour control and reduction in toxicity. 1. Strategies of modulating radiotherapy (SMART). 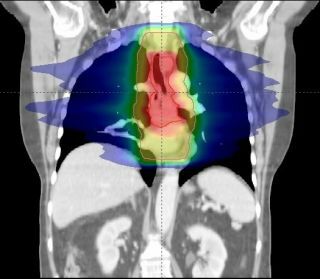 Radiotherapy dose escalation techniques using ‘Simultaneous Integrated Boost’ permit intensification of radiotherapy dose to predetermined volumes within the tumour, derived from biological imaging such as PET or functional MRI. Tumour control probability and normal tissue control probability models can then be used to refine the dose escalation within the tumour further and spare normal tissue exposure. The dose escalation is being tested in the phase 3 clinical trial SCOPE2 for oesophageal cancer in collaboration with Dr Crosby in Cardiff. 2. Margin targeted radiotherapy concept. The use of stereotactic ablative radiotherapy to areas at risk of not being completely cleared with surgery; with the aim of achieving complete tumour resection. This is tested in a phase 1 trial in the preoperative setting for tumours that are difficult to clear due to proximity to critical organs. 3. Refining normal tissue toxicity modelling in thoracic malignancies. The objective of this work is to characterise and corroborate lung, heart and oesophagus radiotherapy toxicity parameters and develop individualised radiotherapy delivery techniques to minimise dose to susceptible heart, oesophagus and lung substructures. This would allow selection of the best radiotherapy dose delivery technique in patients receiving combined chemoradiation and surgery. Standard dose radiotherapy treatment plan for a mid-oesophagus cancer patient. The dose scale is from 6 Gy (blue) to 50 Gy (orange) to 65 Gy (red), and is identical for both images. Increased radiotherapy dose may be delivered using SMART techniques to the central high risk volume with no increase in dose to the surrounding tissues. Clinical development of new drug-radiotherapy combinations. Unwrapping 3D complex hollow organs for spatial dose surface analysis. Conformity analysis to demonstrate reproducibility of target volumes for Margin-Intense Stereotactic Radiotherapy for borderline-resectable pancreatic cancer.